He does NOT say the Heat Wave will go on forever…simply because he does not know…which is always the way it is…In my 37 years doing this, I have yet to see any weatherman accurately predict, “Today’s heat wave is going to turn into an outright long term event…or drought…for the next month or two.” BAD WEATHER sneaks up on everybody…But it ALWAYS has to start with a few days or a week that are too hot…but then it stays that way…I have no idea what this bit of weather news will evolve into but I do note that the grain markets definitely seem to have responded to it with FIRM upside action during the past few days.. 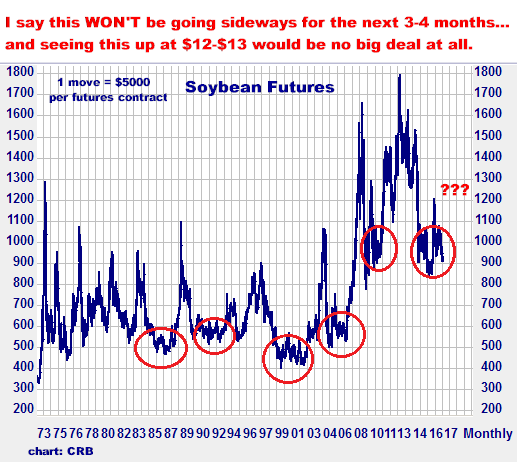 Plain and simple, the next 3-4 months are the most important part of the year for major crops here in the USA. 97% of climate SCIENTISTS support the idea of global climate change and global warming. Anyone who disputes the fact that mankind IS affecting the atmosphere of the planet should sit down in an enclosed room and start lighting cigarettes for just a few hours…and observe the change in the “atmosphere” therein…and then understand that Earth itself is no different than that enclosed room. Our planet does have a ceiling, and without elaborating, I will say that CENTURIES of our presence…meaning centuries of geometrically expanding population…and centuries of any number of manmade emissions being released into the environment…HAVE changed and ARE changing the climate of this finite globe on which we live. Earth’s 2016 surface temperatures were the warmest since modern recordkeeping began in 1880, according to independent analyses by NASA and the National Oceanic and Atmospheric Administration (NOAA)…This makes 2016 the third year in a row to set a new record for global average surface temperatures. 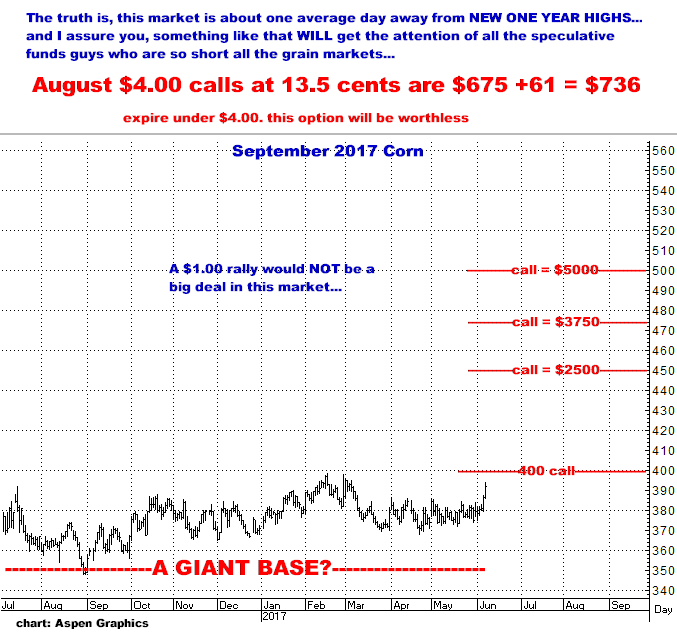 With this, and a few other factors in mind (noted below), this newsletter presents what I would call a very cheap (and HIGHLY leveraged) bet on SOME form of weather event that could dramatically affect prices in Corn, Wheat and Soybeans during the critical next few months of crop development. ----All three of these markets have been depressed and sideways for about 3 years now…much of it at or below the cost of production…Simply stated, IT’S TIME FOR A MOVE. ----All three of these markets are seeing RECORD WORLD DEMAND/CONSUMPTION IN 2017. 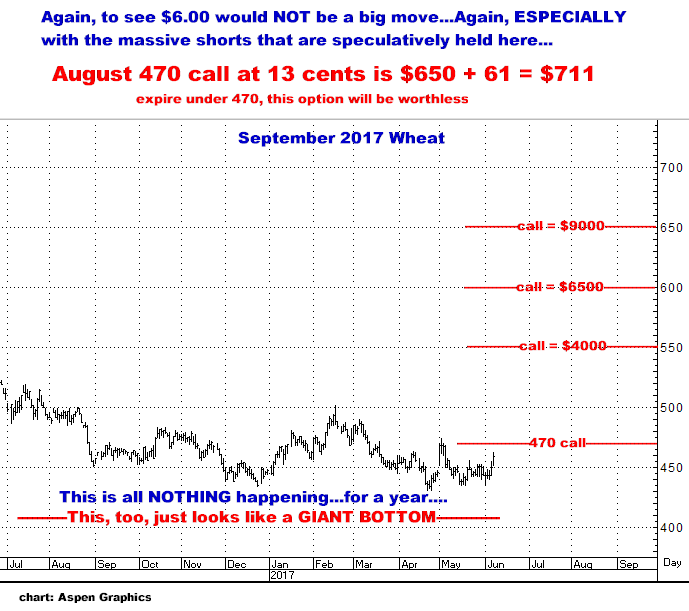 ----EVERYBODY knows what we have in the bins from last year’s production (in other words, current supply has already been priced into the markets). 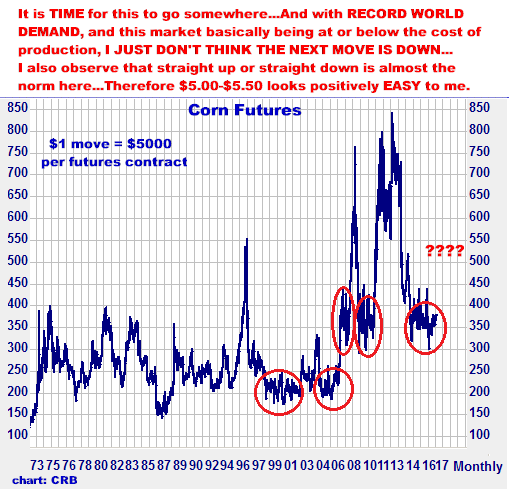 ----Conversely, NOBODY knows what will be produced this year…These crops are just getting planted or are still in the field…and are NOT “made” yet. 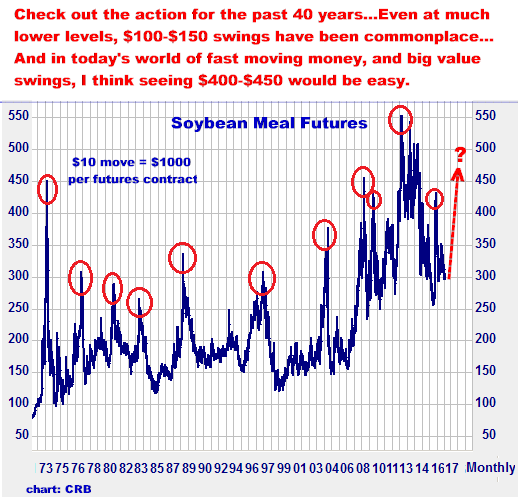 ----Cumulatively, in Corn, Wheat and Soybeans, Large Speculative Funds have recently reached the largest short position in the history of commodity futures trading…In other words, there are MASSIVE spec shorts in the market…and to exit those positions, sooner or later, all those shorts will HAVE TO BECOME BUYERS (and probably not willingly). Although recent forecasts have suggested we are about to see a hot, dry period enter the Great Plains and Midwest (which has already been boosting the markets for a few days now), there is NO WAY to know if we WILL have a true weather event in the coming months…But I would guess we WILL minimally have at least some degree of a weather “scare”, which, with all of the above considered, certainly could produce some extreme fireworks on the upside…in any or ALL of these three markets. So…Do I know what is coming? 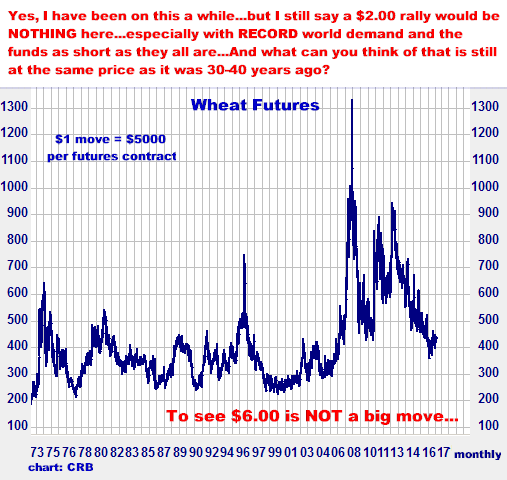 Obviously NOT…but what I DO know is what CAN be in the process of happening…and NOW is when I believe it is important to act…NOT two weeks from now when it becomes supposedly “obvious” that we are in for a rocket ride…maybe in all three of these markets…as they DO often get it going in tandem with each other. Here are the options to buy here…AND I FIRMLY RECOMMEND OWNING ALL THREE MARKETS…To “pick the one you like the most” would, I believe, in plain English, be just stupid. Buy all three as one “unit” for $2163…Do the math and calculate where you would be if just one these works moderately. I may be dead, dead wrong but I almost think it is impossible for all three of these markets to just sit here…or frankly, even go down from their current VALUED levels…for the rest of this summer…I believe SOMETHING has to happen here and I absolutely believe it will be STRONGLY HIGHER…again, in at least one of them. 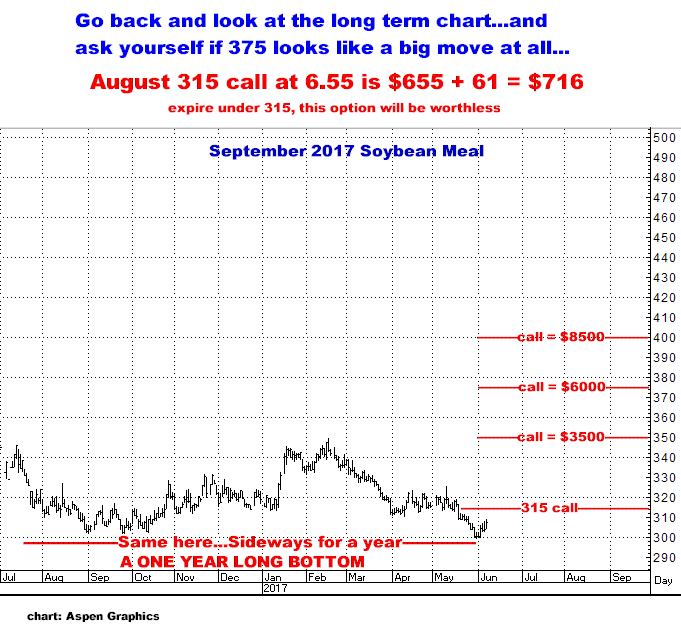 I obviously do not know if any of these moves will be replicated…but I do know that now is the time to be positioned for them…And I repeat, there is NO WAY you are going to know WHEN you “should have been buying “ until long after the fact…So, for my money, you put your money on the table now. Give me a call…sooner the better I say…if you are interested.